Calendar art is often a window to a culture's soul. Hindu mythology, imagery, and customs come alive in posters and calendars. This book does a tremendous job of explaining this sometimes seemingly gaudy art. 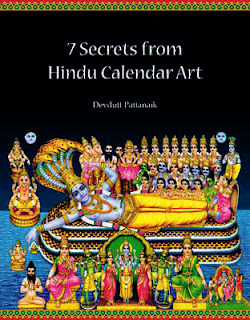 This book is a tremendously rich source of Hindu calendar art. Every other page contains an illustration or a reproduction of Hindu art, while the facing page contains the narrative and explanation. Thus you have hundreds of reproductions and a ready reckoner of what that art means.